Scrying and candles go together like peanut butter and jelly. Candles provide the low, incandescent light that most scryers prefer. The slow, flickering beam of the flame casts animated shadows on the reflective surface of a mirror or crystal. The heat it generates soothes and relaxes the body. And aesthetically speaking, there is simply nothing better than a candle or lamp flame for evoking a spiritual, mystical atmosphere in a room where magical work is taking place. But did you know that you can deliberately use your trusty altar candles as a trance induction device? This technique has been known in the East for centuries, as part of the discipline known as tratakam, or yoga of the fixed gaze. It is defined as sustained, single-pointed focus on an internal or external point. The practice helps to improve concentration, access altered states, and achieve inner sight. Candle-gazing in particular is thought to stimulate the pineal gland, the light-sensitive "third eye" which is linked with clairvoyance. I first discovered this technique would work for scrying in the somewhat unlikely setting of a strip-mall yoga center. The class was what I call the "hatha-plus" variety. We did mostly asana (physical poses), but now and then the teacher would sneak in a bit of her more esoteric knowledge. One day, after we had completed our asana sequence, the teacher passed out tea lights and informed us we would be trying a candle-gazing meditation before settling down for our final resting pose. The students each sat in a seated position, palms resting on knees, with the candle resting on the floor a few inches in front of the feet. With a straight back and neck, we cast our eyes downward to settle upon the wick of the candle. The teacher dimmed the lights, then walked around the room and lit each candle. Immediately a soothing orange glow filled my field of vision. The teacher began to lead a rhythmic breathing exercise, and invited us to alternately open and close our eyes. When my eyes were open and gazing at the candle, I felt blissfully absorbed by the flame. With my eyes closed, I could still see the after-image of the candle and feel its light and heat, but there was also a welcome darkness, pregnant with images and meaning. I opened my eyes for another breath, then slipped back into the darkness. The room I was in disappeared and my sense of time dissolved. I didn't snap out of it until I heard the instructor abandon her usual clouds-and-honey yoga teacher voice for a sterner tone: "Okay, we're done working with the candles now. We have ten minutes left in class. Please move to your mats and prepare for shavasana." Oops. The effects of the trance gradually wore off as I lay there on my mat, but spectacular visions continued to play out on the inside of my eyelids. Of course, since yogic meditation discourages wandering thoughts, I spent the rest of class trying to banish these "distractions." It wasn't until later that I realized that this simple candle meditation had allowed to me to reach a faster, deeper, more visual trance state than I had thus far been able to achieve by scrying alone, and that it might be helpful to hijack the technique for my scrying practice. Incidentally, I no longer have a regular practice of Eastern yoga, mostly because I'm lazy and don't really like to break a sweat, but also because I don't always find it to be compatible with the Western esoteric systems I use. Nevertheless, I'm grateful for the time I have spent studying yoga, because it's helped me to develop concentration, feel more comfortable in my physical body, and perceive and direct my subtle energy. So, you'll need a candle or lantern, a chair (or cushion for the floor), your favorite scrying medium (I generally use a crystal ball 'cause I'm old school like that) and a surface in front of you to rest it on. Light the candle, and make sure you have something non-flammable to set it down on. (Because nothing kills a psychic buzz like accidentally burning your house down.) While you can do this in exercise in pitch darkness, I find that the contrast creates too much eyestrain. 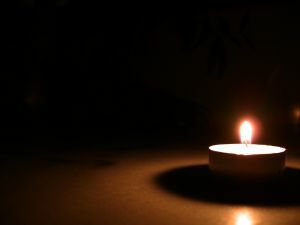 So I recommend lighting a few other candles around the room or having another dim light source going at the same time. Next, sit up straight with your scrying medium directly in front of you. Place the candle in the center of your line of sight, in front of the speculum. (You can always move it away to the side when you're ready to scry). Once you're all situated, do whatever you usually do to prepare for divination: ground and center, set your intention, cast your circle, invoke your guides, whatever. Now begin taking some yogic breaths. This is deliberate, deep, and rhythmic breathing. (Plenty of tutorials online if you need a refresher.) Breathe as long as you need to feel your body relax and your mind to begin to clear. As you continue to breathe steadily, fix your attention on the candle flame and blink naturally. (If your ocular muscles start to strain or your eyes begin to water, then you're doing it wrong. Relax.) See the flame of the candle, feel its warmth spreading out, observe its tiny movements. Visualize two beams of yellow light, one from each of your open eyes, traveling out to the candle to form a triangle. Light from the candle, the apex of the triangle, is traveling back along these invisible paths to your eyes and into your brain. A third beam appears, going from the candle to your third eye, bisecting the triangle. When the light reaches the space between your eyes, it spreads out and massages the area with light. This is a breath-linked practice, so if at any time you get distracted, go back a step and focus on the pattern of your breathing. The next step is to coordinate the blinking of your eyes to your breath. The next time you breathe in, intensify your gaze ever so slightly and draw in the light, as if you were hoarding it for later. As you breathe out, close your eyes. If you've been gazing at the flame for any length of time at all, you'll notice a "burn in" effect--the shape of the fire will still be visible between your closed eyelids. Open your eyes as you draw another breath. Then close them, continuing to gaze at the "phantom" flame. Continue for a set number of repetitions, or, if you're not a counter, until you feel your consciousness begin to shift. Now gaze at the candle for two breaths (in and out, then in and out again), and rest your eyes for a count of two. Do this for a little while, then shift to three breaths. As the space between open-eye periods gets longer, more complex images may begin to appear in the darkness. (By the time I get up to three breaths, I'm usually spaced, but you could try a longer count if you like.) When you feel ready, or when your inner vision begins to awaken, set the candle aside and take up your bowl, mirror, or crystal. As you gaze at it, allow your faculty of sight to gently transfer to its surface. If your preferred method is fire scrying or closed-eye scrying, then you're all set to go already, you lucky mofo. Well, I hope this has been helpful. If you've tried this candle-gazing technique or something similar, I'd be very interested to hear how it went in the comments. Great article, thank you! I'm glad I stumbled upon your blog. What's up with gazing balls? Enjoy this blog? Visit my Amazon.com author page. Blog by Mare Gaudii. Travel theme. Theme images by zbindere. Powered by Blogger.